Listening to music from your computer through external PC speakers is enjoyable. You get to enjoy enhanced sound than what internal speakers offer. However, it can be quite disappointing to plug in your speakers only to get noisy sound. 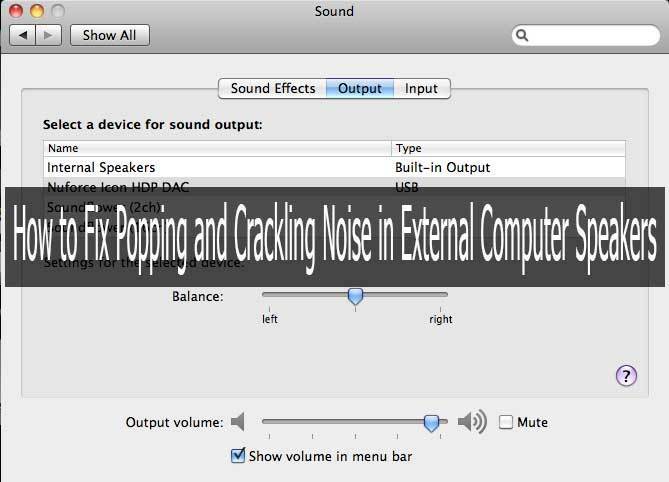 It can be worse to get popping or crackling noise in the middle of a video game or movie. This can destroy your overall listening experience. In case your external PC speakers are making a funny popping or crackling noise, don’t panic. Simply try these fixes and see whether you’ll get clean sound. ​In case you’ve started playing some music on your PC but there is noise, the first troubleshooting option is to check whether you’ve plugged in the speakers properly. Loose cable connections are a major cause of popping and crackling noise in speakers. Ensure the speaker cable is plugged in your PC firmly and all the way inside. In case the 3.5mm pin is loose, you should try another speaker cable. Also, check whether you’ve plugged the speaker cable into the correct port on your PC. While audio enhancements are designed to improve audio in computers, sometimes they create audio problems. They’re a common cause of noise in speakers. In case you’ve installed such software, disable it and check whether the noise issue is resolved. Unbalanced equalizer settings on your PC music player can create sound problems, including noise. For instance, if you’ve used your EQ to boost the bass beyond what the speakers can handle, they’ll make a crackling or popping noise. Simply reduce bass boost in the EQ software until the noise vanishes. Also, when using software EQ, you need to equalize preamp and frequency properly. For instance, in case you increase the EQ frequency and fail to lower the preamp, you’ll get distorted sound, and thus noise. For example, whenever you increasethe frequency by 5 decibels, also reduce the preamp by 5 decibels and vice versa. This way, you’ll not create distortion. Outdated soundcard drivers can cause noise issues in your speakers.Simply update the drivers to fix this issue. For a Windows OS, click start or the windows icon. Once done, type device manager. After that, press enter and select device manager from the results. Then go to the sound category and right click on the audio device. Then choose the update driver option. Allow your PC to search and update the driver automatically. For Mac OS, open the Apple menu. Then click software update. It will list all available updates. In case audio is one of them, update it. Ensure you have an active internet connection when updating the drivers. After the update, you can reboot your computer and check whether you can now get clean sound. ​Deferred procedure call, abbreviated as DPC, is responsible for handling the efficiency of drivers in your PC. It ensures that slow drivers do not interfere with the processing time of other drivers. In case soundcard drivers are not responding in time, the result will be crackling, clicking and popping noise. To fix DPC latency issues, you’ll need to install a DPC latency checker. The software will analyze your system and issue a report on the drivers causing the delays. Update the driver causing the problem and check whether the noise issue is resolved. ​Keeping speakers close to gadgets that relay electromagnetic signals, like cellphones and modems, interferes with sound signals such that a speaker makes noise. This mostly happens when a call or message is coming in or going out. In case your speaker is unshielded, it will produce noise when a mobile phone is kept close to it. Simply move the cellphone away from the speaker. Also, the speakers shouldn’t be kept close to an active internet modem. This will eliminate electromagnetic interference, thus eliminate noise. Different speakers are designed to handle a specific amount of power. If the power they can handle is exceeded, the speakers will produce noise or even get damaged. In case the volume on your speakers is set to the maximum, and you have also set the volume in your PC to the maximum, there may be noise in case the speakers can’t handle the extreme volume. Thus, you need to balance the volume properly. While increasing the volume level in your PC, lower the volume on the speakers to a level where there’s no noise. This way, you’ll balance the volume and eliminate any popping or crackling noise. ​In case there’s still noise in your speakers, you should test them on another device or computer. If there’s no noise when testing them on another PC, then the problem is still in your computer. However, if the speakers make noise when plugged in another PC or even your smartphone, then the problem is with the speakers. You can try another cable and see whether the noise is eliminated. If there’s still noise, then your speaker cone is probably torn or the coil is damaged. If this is the case, have the speaker repaired or get a replacement. In the event that your PC speakers develop sound problems such as a crackling or popping noise, it’s possible to troubleshoot and fix the issue. Troubleshoot one option by one until you get the issue resolved. If the speakers are damaged, get them repaired or replaced. Luckily, you can troubleshoot and fix these issues on your own. By fixing these noise issues in computer speakers, you’ll enjoy clean sound and improve your overall listening experience.